Some people live amazing lives. On a visit to Berlin a few years back, I went to a book reading by a remarkable 80 plus-year-old who I’d never heard of until then. I haven’t forgotten him since. Hans-Jürgen Massaquoi spoke softly into the microphone in a German tinted with his native Hamburg accent though he left Germany in 1947. 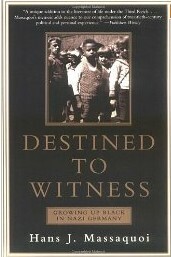 H e was a journalist, former managing editor of Ebony Magazine, introducing his autobiography Destined to Witness. He witnessed Nazi Germany and the postwar years like few others did. His mother Bertha raised him alone in a Hamburg neighborhood. His father, a Liberian student and grandson of the consul general of Liberia in Germany, rarely visited. So there he was, a half-African German boy under one of the most racist regimes that ever was. He couldn’t hide from the Nazis; his skin would always betray him. Ironically, he didn’t have to hide. He went to school, lived happily with a loving mother, and later learned a trade. The network of people who knew him in his Hamburg neighborhood sheltered him somewhat from the worst of the regime. But the Nazis made it clear he was a second class citizen, and he endured racism from classmates, teachers and others. For him, being second class had a few advantages. He wasn’t persecuted like the Jews, Sinti and Roma. He was forbidden from joining the army, a blessing in disguise. Reading his book, I came away with the feeling that his story wasn’t only about growing up mixed race under the Nazis. It was about a boy who desperately wanted to belong, and couldn’t. He wanted to join the Jungvolk, the Hitler Youth for younger children. He wanted to join the Wehrmacht. I didn’t get the impression he was ashamed of having felt this way, and he shouldn’t have been. It’s natural for a child to want to fit in, no matter what environment he grows up in. He survived the war, the fire bombing of Hamburg, and entered the postwar years. For the first time, he saw men who looked like him, African-American soldiers. After a short stint in Liberia, he emigrated to the United States — a country with its own problems with race. But there, he found what he was looking for. He served in the army, went to college, launched a successful career as a journalist. At the book reading, he seemed to enjoy every minute of the respect and wonder the German audience gave him. I shook his hand and asked him to sign my copy of his book. A brief encounter, but one I won’t forget. Hans-Jürgen Massaquoi died on January 19, 2013. RIP.